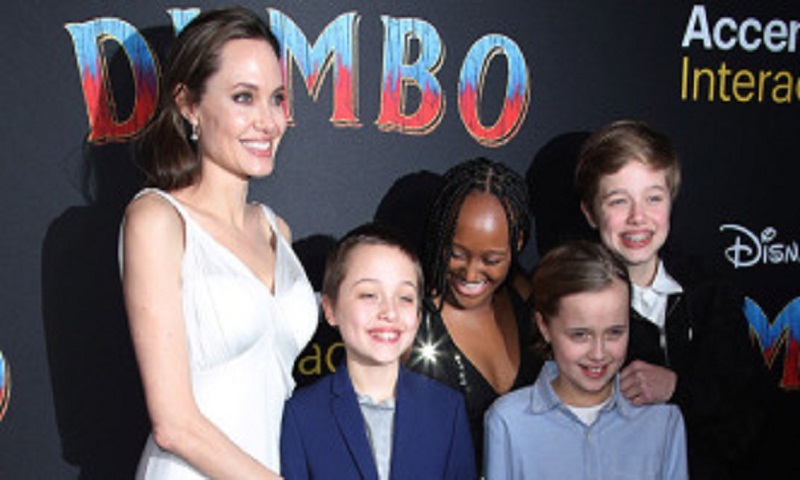 Angelina Jolie attended the world premiere of Disney’s upcoming live-action remake of Dumbo with her four youngest kids on Wednesday. The actor walked the red carpet with her children, Knox, Zahara, Vivienne, and Shiloh, report Hindustan Times. Jolie, wearing a Versace gown, was all smiles as she guided the children down the red carpet. Twins Knox and Vivienne, and Shiloh and Zahara have two older brothers, Pax and Maddox. Shiloh continues to dress like a boy, and looks like a spitting image of her father, Brad Pitt. While Jolie isn’t in Dumbo, she is a part of the Disney family and will soon be reprising her role in the sequel to Maleficent. Directed by Joachim Ronning, Maleficent: Mistress of Evil is slated for an October release. Jolie and Pitt separated abruptly in 2016. They have since been involved in a bitter custody battle over the children. A settlement was said to have been reached recently, which allowed Pitt more unsupervised time with the kids. It had previously been reported that he was against the children living a globe-trotting life with their mother; Pitt wanted them to be stationed in Los Angeles, where he is filming his next movie. Jolie’s reps had also alleged that Pitt had failed to provide adequate child support, which he denied, and added that he had ‘loaned’ Jolie millions. The former couple was spotted together for the first time since the split recently, at a custody meeting in LA. A few days later, Pitt was seen attending the 50th birthday party of ex-wife Jennifer Aniston.